One of our clients, an international manufacturer of specialty vehicles, had plans to attend a conference in the United States. They needed a memorable giveaway to hand their customers during this event, so they reached out to us for ideas. 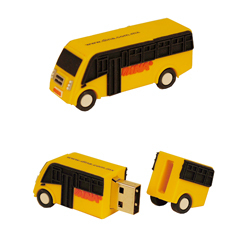 The client's representative did some research and decided to show them several unique products, one of which was a replica of one of their signature vehicles - a bus - in the form of a USB. The client thought this idea had wheels and jumped on board. Soon, these tiny, useful and creative USBs were in the palms of their customers all over the United States and Mexico. Need a new product idea for your next event? Then contact us - we'd be more than happy to give you a lift!